Allie’s children. | Scuffalong: Genealogy. Allie’s children. – Scuffalong: Genealogy. Two of Lucinda McNeely‘s sons are accounted for, but what of her older children, John and Alice? Alice’s son Joseph Archy McNeely was born about 1849. 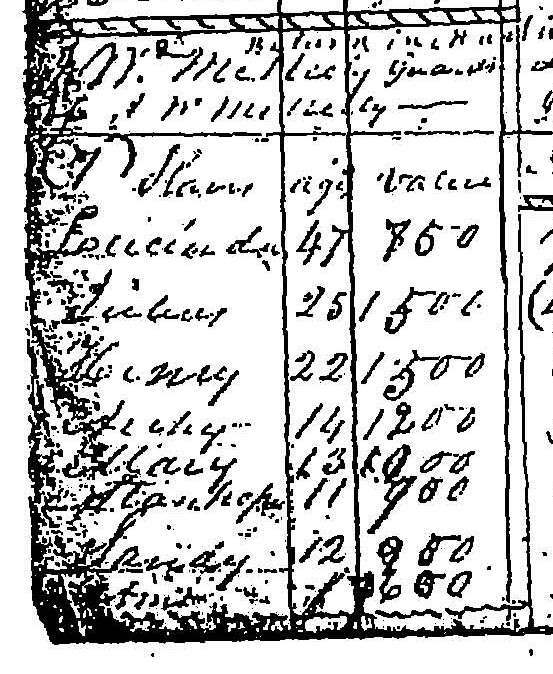 In the 1870 census of Atwell township, Rowan County, 22 year-old farm laborer Joseph A. McNeely is listed in a household with Lucinda McNeely, 54 year-old domestic servant, Henry McNeely, 29, schoolteacher, and Elizabeth McNeely, 13. Three years later, Joseph Archy McNeely applied for a license to marry Ella Alexander and listed his parents as Henry Courtney and Aley McNeely. (This is the second known reference to Alice.) Over the next 22 years, the couple had at least eight children: Octavia J. (1874), Lucinda (1876), Ann J. (1879), Callie B. (1885), Julius L.A. (1891), Mary E. (1893) and Joseph Oliver (1896). I have not been able to locate Alice’s daughter Mary after 1863, but in the 1870 census, her sons Sandy and Stanhope appear in their uncle Julius McNeely‘s household as Alexr. and John S. This is the last record I have of either. Some years ago I decided that Lucinda’s son John was John Rufus McNeely, generally called Rufus, who died 1870-1880 in Rowan County. He married Emeline Atwell about 1855 and was father of five children: Mary, Betty, Charley, Henry and Rufus Alexander McNeely. John’s absence from the 1863 list mystifies me, though, and I’m not sure how I came to this conclusion. For now, I’m withholding sanction. UPDATE, 26 January 2014: John Rufus McNeely’s 1866 cohabitation registration noted that he was the former slave of John W. McNeely. As the rest of J.W.’s slaves comprised a single family, I renew my conclusion that John Rufus was Lucinda McNeely’s son. ← Misinformation Monday, no. 2. Pingback: Family cemeteries, no. 3: Boyden Quarters. | Scuffalong: Genealogy. Pingback: Total value: $7,600. | Scuffalong: Genealogy. Pingback: McNeelys enumerated. | Scuffalong: Genealogy. Pingback: Cousin Rufus McNeely. | Scuffalong: Genealogy. Hi I am looking for an ancestor by the name of Lucinda McNeely, I’ve found evidence that may suggest that she was from Rowan County, NC. Likely a slave. One of her sons would have been Lee Henry Elijah McNeely. Any help, leads, or steer in the right direction would be wonderful. Hmm. That certainly intrigues me, as my great-great-great-grandmother was named Lucinda McNeely. What years did yours live?